Donatella grew up in ITALY. Italian men, including those in diapers and strollers, don't exactly have a reputation for hiding their true natures, passions or beliefs. Who put these dumb words into Versace's mouth? She grew up surrounded by brothers! Robin Here at NST™ had another take on Donatella, using Versace's quote "I love how Dylan Blue captures such an evocative world of Versace masculinity." Robin: Then, I picture her closing the door of her room, laughing, and counting her money. I don't know Ms. Versace personally (she seems nice enough in interviews), so I don't relish her successes...or gloat over her failures. Call me stone-cold. However, Donatella Versace is the face behind a big business; she has (one surmises) CLOUT, and she must know what great perfume smells like (I could be wrong) and yet she continues to put the Versace name on dull fragrances. That's annoying because in the past Versace released some good perfumes. Of course, I could be putting the blame in the wrong place: Euroitalia is the Versace brand's licensee and they speak nonsense in PR new releases all the time. For instance, in Women's Wear Daily, Euroitalia President Giovanni Sgariboldi said the company “must remain concentrated on the development of innovative products and present novelties that really are so.”2 I can't use the words "innovative" or "novelties" in the same sentence with "Versace" and "perfume." 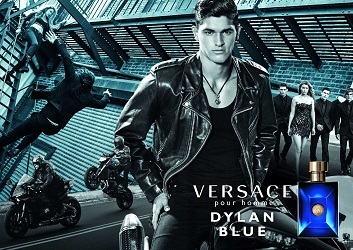 Versace Pour Homme Dylan Blue is described as a woody fougère fragrance (and it's a flanker to 2008's Versace Pour Homme); Dylan Blue's notes (supposedly) include bergamot, grapefruit, fig, violet leaf, aquatic notes, black pepper, papyrus wood, ambrox, patchouli, mineral musk, tonka bean, saffron and incense. 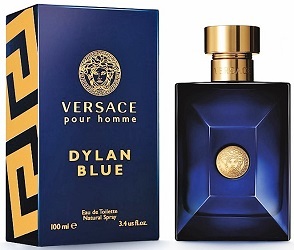 Dylan Blue begins with promise; there a vibrant (talc-y) bergamot note, some high-pitched/aquatic fig (decidedly phony, but unusual nonetheless) and a delicious "overripe" grapefruit skin note. Add to these some pepper and dry papyrus and you have a ZINGY opening! But as I feared, "zingy" quickly loses its "ingy" and we're left with zzzzzzzzzzzzzzzzzzzzzzz. Wake up! After its strong start, Dylan Blue reverts to dull-as-dishwater, department-store form and hauls out a no-brainer musk-tonka-ambrox base (with a floral touch...what flower? I couldn't tell you). Dylan Blue has good sillage and lasting power. The fun opening lasts a tad longer if you get some perfume on your clothing. In my perfume infancy, I might have bought Dylan Blue based on its opening the moment I sniffed it in a store. I've learned my lessons: no buys unsniffed and no buys until a fragrance develops on my person for at least a few hours. If you need a chuckle do watch the Bruce Weber disaster of a perfume ad...words, music, set, theme, "acting"...all equally horrendous, and dated. 1. Women's Wear Daily, 7/20/2016. I’ve come to have zero interest in trying anything Versace but I’ll need to seek this one out for the zingy opening alone. Dusan, I LOVE the scent of citrus peel, even overripe! I adore it, too. Just the other day I was reveling in the glorious opening of Chanel pour Monsieur. May it never be tampered with! I don’t get the name? Am I alone in that? Love the bottle! Anyone try the Versace Oud lol? Chandler…so far, have not seen an explanation of the name. The Oud is a nice twist on the discontinued Versace Man. The price is prohibitive, though. I’ve never really understood who buys Versace *anything*. I mean, it’s really hard to pull off kitsch, and even then it only works, like fancy dress, as an occasional interjection into real life. No? Koenigsberg…just popped over to versace.com and agree…these are not everyday clothes. But if someone gave me the techno nylon raincoat in beetroot color I’d wear it happily in Seattle’s gloom! I’m so puzzled that Versace is still around. Seems like it’s been moribund for years. Kevin is so spot-on about the video — terribly dated, impossible to sit through without wincing at how painfully out of step it is with even the most ordinary conventions of luxury branding. It’s proud and delusional, like Madonna presenting her shopworn sexuality as an in-your-face argument that everyone is already long convinced of and bored with. That’s Versace in a nutshell. As for this particular fragrance, I was struck by how cheap and shrill the ingredients smelled — like industrial solvents prettied up to sterilize train station toilets or strip linoleum. It’s not just dull, it’s ugly and cynical too. Perfume quackery. michael.j: I was trying to find another soul who “dared” criticise the video but gave up after reading rave after rave. HA! So, thanks for chiming in. Versace seems in a rut. Versace L’Homme was bold and beautiful, and The Dreamer, even if I didn’t totally love it, was fanciful and somehow enticingly disagreeable. I’m impressed that you’re able to discern any particular notes in perfumes like this one. I just can’t. In Fran Lebowitz’s chronicle of the hilariously tragic fabulosities of 1970s New York, Metropolitan Life, her aesthetic outrage at the “audibly tanned” prefigures the synesthetic assault we now suffer at the onset of a stubborn case of the Dylan Blues — we hear it, see it, and feel our guts spasm in revolt to it long before a full infection sets in. It’s an epidemic and there are many nearly identical strains of the infectious agent that are curiously resistant too all remedies of ridicule and good taste. I will have to concur with you there. When L’Homme came out in the 80s, I stepped onto an elevator to find a man who had just put it on. It’s the only time I can recall asking a guy, “What is that? That’s goooood!” Not because asking another man about his fragrance is strange, but because men’s dept store scents tend to bore me to tears! Maybe he’s desperately trying to tell us something! Noz: well the world is full of non-perfect people of all ages but Weber never photographs them! He’s not a renegade. I guess even he must be bored with his work by now. Do you like the idea of deodorant in a beautiful bottle? Looks like you know what to put on your Christmas list! I dunno, I kinda like the ad. Makes me feel like I’m watching a Westside Story/Spaghetti Western mash up (but with kickboxing and ice cream)! I have not smelled the fragrance, so that is still in the air as to whether I like it or not… But that commercial, I would wish for Amnesia so as to absolutely and totally forget what an atrocity of film this is. Horrific might be too tame a word to appropriately encapsulate how astonishingly DREADFUL it truly is! I must, methinks, sip a good Bourbon on the rocks to calm my inflamed psyche now! 2) That film for the perfume is freaking hilarious. Nobody on the Jersey shore looks like that. NOBODY. And why are people in their undies in the streets, rolling around in water? Who stole that kitten? So many questions.